As the first rays of daylight spread their golden glow over the vast expanse of sky above the Russian Front, the menacing roar of heavily armed Bf 110’s of 6./ZGI shake the cold air around them as they prepare for a dawn strike against enemy ground targets deep inside Russian territory. Above them, their Me 109 escorts, alert for danger, constantly scan the distant skies for any enemy intruders that may be on the prowl and waiting for them. 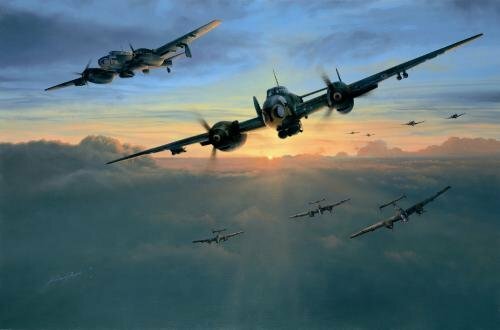 Now an established figure with aviation art collectors, Richard Taylor has, once again, used his inordinate skill to complete yet another masterful new painting, a wonderfully atmospheric image that fuses the radiant beauty of nature with the perilous threat of war. Joining the Luftwaffe in 1942 he became a Wireless Operator and Airborne Radar Specialist serving on various types including the Ju86, Heinkel He219 before flying the Me110G with NJGI. Richard Taylor’s beautiful, highly-detailed pencil remarques are not only a joy to behold, but are also highly collectible investments. Two Remarque editions will be issued with DAWN STRIKE, both featuring the classic Me110. The first, limited to 25 copies, will each have an ORIGINAL pencil remarque; the second, restricted to just TEN COPIES, will be issued with either TWO separate and individual drawings or an outstanding DOUBLE SIZE remarque drawing.